If you need a batt insulation company in Smithfield, Virginia, Tidewater Insulators can help you. We work with homeowners and builders/contractors to install fiberglass batt insulation in homes and commercial buildings, for both retrofit and new construction projects. 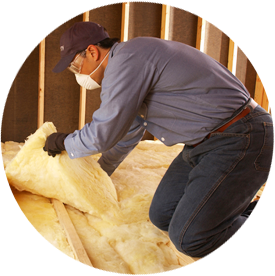 At Tidewater Insulators, we install fiberglass batts insulation in walls, ceilings and floors in Smithfield. If you’re located anywhere in the Tidewater region, including Smithfield, our team can help! Tidewater Insulators uses fiberglass insulation products from Knauf Ecobatt. Knauf Ecobatt’s are certified to GREENGUARD indoor air quality standards, the toughest in the business. All Knauf Insulation fiberglass products are sustainable due to the high recycled and renewable content. Being a part of the Installed Building Products family of companies, Tidewater Insulators offers knowledge, experience and resources that few companies can match. Get in touch with us to learn more about our insulation services or if you’re ready to start your project in Smithfield, VA—call us at 757-828-0024 or fill out the form on the right!